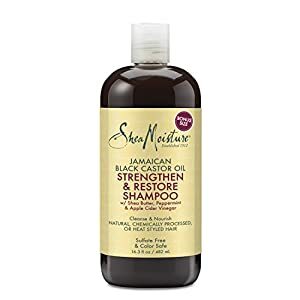 Best Shampoo for Dreads Reviews: Only 6 Out of 134 for April 2019! Dreadlocks are a wonderful option for those who don’t want to waste their time on hair routine in the mornings. Regular washing, drying, and combing are alright and may have become a habitual practice for you already, but why bother if you can just get dreads and forget about all that crap for a very long time? Still, however little effort they require, there are some recommendations on how to keep your locks properly. And to do that, you need the right shampoo. But how do you know which one will make the best shampoo for dreads? Let me tell you. Before you decide to get locks, make sure you know how your skin and hair react to different products and what your hair type is. Does it get greasy quickly or is it rather dry? Wearing locks won’t change the oiliness of your scalp, so, with that in mind, you should aim towards a golden mean and choose a product accordingly. You should also avoid shampoos with straightening effects, especially if you are in the early stages of dreading. But even if you are not, it may still affect the dreadlocking progress, so it’s better to avoid them. Nevertheless, it is always a wise thing to consult a loctician (a dreadlock specialist) about the best way to take care of your locks. No matter what method your locks were formed in, it is still necessary to take proper care of them. Although you may not need or feel like washing them as often as the unlocked hair, yet it’s a good thing to do at least once in a while. What makes a difference here is keeping the dreads dry. Otherwise, they can start to mold. To minimize the chances of developing mildew, use a towel and a powerful blow dryer. This can take longer than unlocked hair routine, but the good news is you won’t have to do it as often. Also, mind the weather conditions. Dreads are as sensitive to the low temperatures as the non-dreaded hair, so make sure you have dried properly before going out. If not, your hair may grow brittle and start to fall out. It’s also good to increase nourishment during the cold months. The conditioners are undesirable, however – they stay in the thickly packed dreads which will increase chances of mildew or bacteria. A residue-free strengthening shampoo with castor oil or shea butter can become a key to resolving that matter. If you don’t have any locks or braids, it doesn’t really matter how much residue the shampoo has – you can easily rinse it out. But the dreads are thick, so to wash them effectively, look for a product that doesn’t build up, which, in case it does, can lead to some very unattractive consequences. The dreads, if kept improperly, are likely to hold moisture which can result in smelly locks and mildew. To avoid it, look for residue free shampoo for dreads. Also, please remember that the wrong wash may cause allergic reactions and lead to flakiness and itchy scalp. Since around 2015 and up to now, the discussion around dreads inevitably heats up regarding whether it is okay for white people to wear them. Dreadlocks have a long history and can be formed both naturally and on purpose, which makes them quite an international phenomenon. So, no matter what race you are and what hair type you have, if you stop combing it (but not washing), it is very likely to turn into dreads. Other common names for dreadlocks include dreads, locks or locs. Although in this article I’ve chosen to use the words interchangeably, some argue there is a difference between the two that should be articulated. Some claim that the word “dreadlock” is derogatory and refers to the times when empires were colonizing and enslaving local people and therefore should be omitted. Others don’t mind it and call their hairstyle dreadlocks. Altogether, it’s up to you how to call your hairstyle – you are free to choose. For 40 years Giovanni has been providing a wide range of natural products to the U.S. hair care market. If you are looking for something gentle and totally natty, you may want to try this wash. Its formula doesn’t contain any severe chemicals and has never been tested on animals. Also, this is probably the most reasonable price on the list. The shampoo has a fresh minty flavor and doesn’t build up residue – a very desirable feature. It is sulfates-, gluten-, parabens- and phthalates-free and can be used by vegans. The botanical oils used in its composition – tea tree, peppermint, thyme – provide soothing and healing effects. 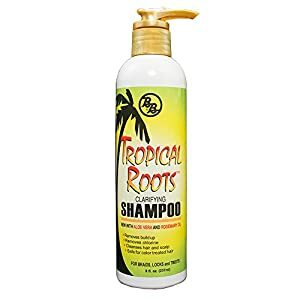 This can make the best shampoo for dreads and dandruff since it removes flakiness, revitalizes and nourishes your hair and skin. Although Giovanni products are hypoallergenic, do a patch test on your skin at first and make sure you are not allergic to any of the components. Avoid eye contact. Probably one of the most popular products on the list. 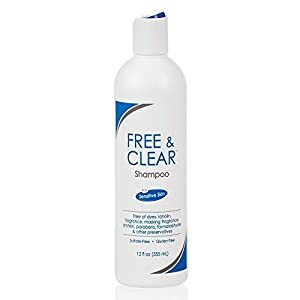 This is a mild and light wash that will make your locks feel fresh and your scalp, if you have any issues, will feel much better. Some may find it a bit harsh, but since it does not build a great lather, you may want to try it if your skin is not very sensitive – it won’t hold moisture in the locks nor will it cause mildew or a repelling smell. This non-medicated shampoo for dreads has no fragrance and is sulfates-, alcohol-, and gluten-free. It has not been tested on animals and does not contain animal products either, which makes it suitable for vegans as well. If you have a coconut sensitivity, mind that the product contains sucrose cocoate and coco glucoside – products derived from coconut. Other than that, this shampoo contains no other nut-derived components (although technically a coconut is not a nut). This wash contains a rich mix of natural extracts that will leave your locs clear and alleviated. It lathers up easily and does not leave an extreme residue, which makes it suitable for the people with dreads. It is also cruelty-free and biodegradable, so if you are concerned about our environment, rest assured – this wash will do it no harm. The wash has a pleasant fresh smell; although it has a somewhat runny consistency, it creates nice lather, which can sometimes be an issue for all-natural product neophytes. The core ingredients include revitalizing peppermint, tea tree oil, and eucalyptus. This residue-free shampoo for dreads gives a slight tingling sensation which is due to the oils used in the formula. Please, check the labels carefully before use to make sure the product will not cause any allergic reactions. This Shea Moisture shampoo for dreads is a must-have for anybody who has any skin issues or just wants their hair strong and nourished. The blend is rich in vitamins and anti-fungal components, so it will both thoroughly cleanse your locks and prevent mildew, scratchiness, and dandruff. Although it seems that this is the best shampoo for black dreadlocks, white people can also benefit from it. Shea butter helps to hydrate and restore the weakened hair, Jamaican black castor oil (JBCO) improves the pH, provides anti-fungal effects and thickens the hair and peppermint invigorates the skin revealing itchiness and dandruff. The wash smells like playdough, is of thick liquid consistency, lathers quickly and doesn’t leave any residue. The products that contain Jamaican black castor oil are great for winter months. Low temperatures cause dryness, dullness and hair embrittlement and loss, but JBCO solves all of those in no time. During the cold months, the dreads and braids become vulnerable, so it’s important to find a product to address those issues in the best possible way. So why not use this Shea Moisture shampoo for dreads? This shampoo does a good job cleaning the hair, not stripping it of its natural oils. This can be a fair thing to consider if your hair tends to get dry. Also, this wash is probably the thickest in texture compared to others on this list, so it will last very long which makes it a pretty fair deal. The two main components include alma oil (also known as Indian gooseberry) and coconut oil. Both are great for hydrating and banishing flakiness. This shampoo has a mixed smell of kiwi and apples, though some may find it a bit strong. This wash is low in residue but, to achieve the best results on the locs, it is recommended to start applying it from the roots – it will spread then down the length and lower the chances of getting trapped in the locs causing bad smell and mildew. Please avoid eye contact. For over 70 years Broner Bros. has been holding the leading positions among the providers of the skin and hair care products. Focusing on the African American customers, the company has developed formulas that best suit the black hair. 2 top components here are Aloe Vera and rosemary oil. Aloe Vera moisturizing, emollient effect and rosemary increases the scalp’s microcirculation and improves hair growth. The latter also gives it its mild, warm flavor. This shampoo is not free of sulfates. It contains sodium laureth sulfate (SLS) which, although it helps create lather, may lead to an allergic reaction. It also leaves more residue compared to other products on this list. There is a whole world of different washes suitable for people with all kinds of locs and braids. And with little effort, now you can find your personal best shampoo for dreads. Now, how cool is that?! To choose the most efficient product, it is important to know how sensitive to the components you are, since most of the washes contain a substantial amount of botanical oils and some can cause reactions. Make sure that what you choose is practically viable for your situation: if your hair is prone to greasiness, look for something that will improve the oily skin; if it’s dry and brittle, choose something moisturizing and nourishing. The aim is to keep the scalp balanced. The most important thing, though, is the residue level in your wash. Usually, locks are very tight and thick, and that prevents moisture from vaporizing which can lead to mildew and foul smell. So it is essential not only to choose a residue-free shampoo for dreadlocks but to blow dry them thoroughly as well. But don’t let that repel you or prevent from getting locks if you haven’t got them yet. Dreads do not require to be washed as often as the hair without locks. In overall, do the washing whenever you feel the need to. The whole idea of changing hairstyles and looks is in making yourself feel great, confident and empowered, right? Hope you enjoyed the article. Let me know which of the washes is your favorite and makes the best residue-free shampoo for dreadlocks? You are welcome to share your thoughts and experiences in the comment section below.